The bond which we share with our brothers is peculiar because it doesn't confine itself to a fixed definition and boundary. Previously, Rakhi festival encompassed the warmth shared between the siblings but now it goes way beyond it. With FlowerAura, send rakhi to Ahmednagar fostering brotherhood. Rakhi tying is no longer limited to blood siblings; you may also know a person with whom you connect and then realize that he’s a family member. You just need to accept someone as your brother from your heart and they become your rakhi-brother. Its a similar bond with equal degree of affection. In turn, the brother blesses the sister and vows to take care of her throughout her life, which amazingly stretches beyond her marriage too.The bond of real love does not hold any biases on any ground. A sister, mother, even friends can be just as protective as a brother and serve it’s true spirit. Convey your message of rakhi to whosoever you wish to by sending rakhi gifts to Ahmednagar with an option of instant shipping and it’s very much convenient with the online store of FlowerAura. 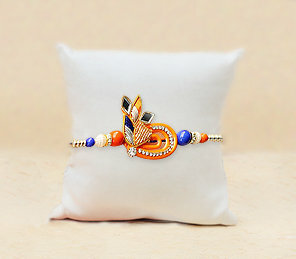 No matter where you stay, even if you stay out of India you can still send enticing Rakhi gift in India from FlowerAura. With the strong network of more than 200+ cities, sending Rakhi gift to any cities in India from this online store is like a cakewalk. On this full moon day of the month of Shravana, are you wondering of how to make this Rakhi special? With FlowerAura you don’t really need to because our dedicated team is always ready to take your pain and make rakhi gifts delivery in Ahmednagar with full perseverance. All you need to take care of, is to order your favorite rakhi online from our web-portal. With our super fast delivery, we assure the timely rakhi gift delivery in Ahmednagar, at the doors of your brother on the very same day. At present age, all of us are going through a number of negative aspects like religious conflicts, warring nations, terrorism and so on. All of these problems have only one solution; rakhi, the feeling of brotherhood which can eliminate all of these troubles. On this auspicious day of Rakshabandhan, when the sacred relation between a brother and sister is celebrated, it is worth taking a note of the incident when Tagore urged Hindus and Muslims to tie rakhi on each others wrist and express solidarity with one another. To celebrate this spirit in Ahmednagar, we at FlowerAura provide the facility of sending rakhi for brother in Ahmednagar in a very short span of time with an option of Express delivery.